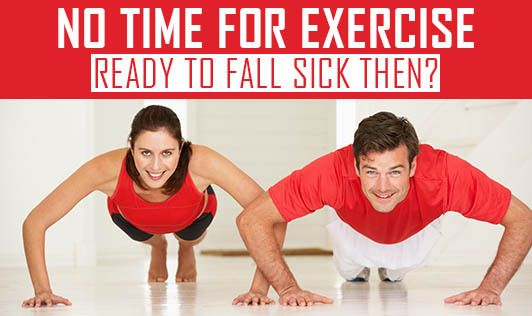 No Time for Exercise - Ready to Fall Sick Then? I have no time: Great! Do you have time for a heart attack? For managing diabetes, dialysis or cancer? If you have no time to work out, then you have to be ready to deal with these degenerative diseases for the rest of your life. I cannot afford it: Can you afford your medicines and hospital bills? In fact, investing in fitness is one of the best investments you can ever make. Don't you remember the famous saying of Swami Vivekananda?-"Health is Wealth"
I'm very tired: The best way to de-stress yourself is to exercise! Exercise improves blood supply and stimulates each cell in your body. Don't rest so much that you RUST! I look fine, I don't need to exercise: Everybody benefits from exercise. Exercise is not just for those wanting to lose weight. Osteoporosis, high cholesterol levels and high blood pressure might be creeping under your skin without any obvious sign. Protect yourself by exercising and keep these threats at bay. Exercising every day is boring: Do you get bored of eating, brushing your teeth and dressing up every day? Exercise should be treated as an integral part of our daily activities. Exercise is a repetitive process that should be done every day to maintain a healthy body. My doctor suggested me not to: No doctor would ask you to quit exercise for a lifetime! It will only be for a particular recovery period. Don't make it your false excuse and fall trap to more serious diseases. Too busy with work: Everybody is given 24 hours. It is how you plan to spend that time in the best way you can. Making time for exercise can help you stay healthy, and prevent you from spending your savings on treating diseases in the future. I am too old to start now: Studies in the medical community say that after the age of 50, your body starts losing 2% of muscle every year increasing your risk for many diseases. The best way to balance it out it is to exercise regularly. I have seen clients in their 70's gaining back strength and mobility after regular exercises. So what is your excuse? The list may be exhaustive, but exercise is necessary to keep you healthy! Lead yourself on to a path of better health. Make a small start today and you will see good health follow you for a lifetime.